Congratulations! Your interview is set for a development director position at a nonprofit you’re interested in. What now? There’s a lot of prep work you can do for the interview to improve your chances to stand out from the crowd. It’s rare to see people come to an interview fully prepared and if you follow these 5 tips, you’ll set yourself apart from the other job candidates. Finding an excellent fundraiser is rare in the nonprofit space. By demonstrating both your fundraising knowledge and your desire to work for this particular organization raising funds for this particular cause, you’ll show the hiring manager that you are the type of candidate they’re looking for. As I wrote that title, I searched for a better way to express this idea. I don’t mean to simply learn about the organization, but to learn as much as you possibly can about the organization before your interview. Who was the organization’s founder? Did he write a book? (read it). Who is the current President or Executive Director? Did she write a book? (read it). Does she blog? (read her blog posts). Keynote a conference? Watch the replay. Look on LinkedIn and study who is in key positions you’ll be working with. Did you go to the same college? Major in the same area? Have connections in common? Do stealth research to discover the people and the history of the organization. Study the organization’s “theory of change.” How does their programmatic work seek to change the outcome for the beneficiaries? What makes them unique? Is the organization or their people referenced in academic research (use Google Scholar or your local library databases to search)? Be thoroughly prepared to answer questions about the organization if they arise. You learn a lot about an organization based on their fundraising. Are they aggressive? Do they have more hope-based messaging? What is their frequency of appeal? Do they have a continuity program? A match? Sign up for the organization’s email list. Make a small donation and see how they welcome donors. Read their direct mail. 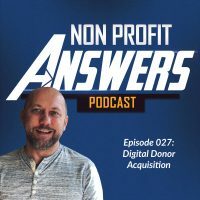 Discover how they’re currently doing their fundraising, marketing organization, talking in social media, and communicating with donors. Having a firm understanding of their fundraising efforts to date will set you apart from most of the candidates. Be cautious about how you answer questions about the organization’s current fundraising. You don’t yet know the position of the interviewer about the current fundraising and if you’re too harsh, you might be stepping on her toes. Instead, if asked, talk about the highlights of what you see that’s working with some key insight into positive changes that could be made. Rarely have I been hired at an organization when I didn’t have a connection. Search your network (use LinkedIn or Facebook) to find someone you know there or someone with a second or third connection. Having an internal champion, even if it’s someone not in development, can only help your cause as you’re going through the hiring process. If you aren’t directly connected to the organization, but have a second or third level connection, feel free to connect with someone at the organization and ask them out for coffee or an informal lunch to get a feel about working at the organization. You may find insights that you wouldn’t have gleaned elsewhere. a. What do you love about this organization? Excellent fundraisers are hard to find. Often an excellent fundraiser has a combination of the required skills and a love for the organization. The interviewer is seeking out whether or not you’re someone who will have a passion for the organization or cause even when the going gets tough. Describe what you love about the organization and the cause you’re supporting. b. Do you love fundraising? What draws you into this career? Why fundraising? Fundraising is a difficult profession. Many of us are drawn into support a particular cause and use fundraising as the mechanism to do it. The interviewer wants to understand your motivations for being in fundraising and whether this is a long-term career decision for you. Talk about the elements of fundraising you love and why you’re drawn to it as a profession. c. How do you ask for a major donation? At many organizations, you’re going to be called upon to work with a major funder and ask for a donation. The interviewer wants to see the process you go through to build a relationship and make an ask. This is the perfect opportunity to use a fundraising story from your past about a prospect and how you asked for and received a large donation. d. How would you describe the organization to a prospect to motivate a donation? The interviewer wants to see how much research you’ve done about the nonprofit and whether or not you understand what sets the organization apart. Describe the organizations unique selling proposition and how it sets the organization apart from the competitors. Discuss impact and how far the donor’s dollar goes at this organization. e. In a previous position, describe a situation where you overcame resistance to fundraising from a board member or member of the program staff. Not everyone is going to love our fundraising all the time. In fact, the interviewer might be struggling with this situation right now! Tell a story about someone who didn’t agree with your fundraising and how you addressed the situation but still ran a successful fundraising campaign. Describe how you would deal with different types of people from the board to the executive director to program staff. Review my list of 25 interview questions for development directors to see how you would answer those questions. Tell your case study like you would a story. Don’t reveal details too soon, instead, let the story build up and through the failures until you found success. Interviewing for a development director role can feel stressful, but if you follow these 5 tips, you’ll set yourself apart from the other candidates.